Yes - it was very cold today .... no no no ... it was FRIGID! Snow surface temps reached negative 24 Deg-C, and air temps hovered at negative 18 Deg-C during the warmest period of the day. I had to climb all the day with my warmest and gnarliest glove, and that I keep buried deep in my pack for cold/stormy days when skiing down. As I am writing now, I can still feel a weird feeling on my toes after coming out from their deep freeze. But it was also a windless day with clear turquoise blue skies, 35 cms of light density POW at West, North, and East aspects. Slopes with a south component had a more creamy and thinner coating of snow at 25 cms in top of a melt freeze crust. Morning sun at the Bull Trout Lake Glades - Summit. 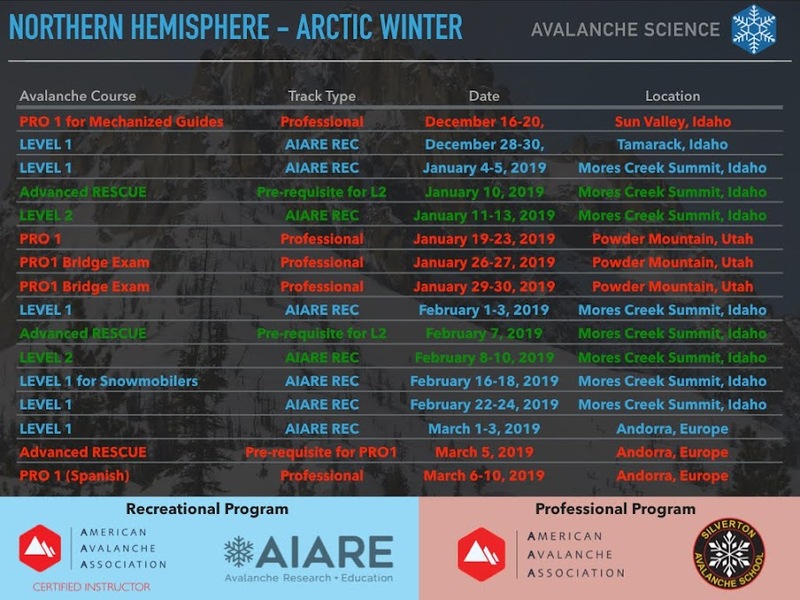 I have been lucky to meet some incredible folks during avalanche courses. Today I was privileged to be skiing with friends that completed their Avalanche Level 2 course at Anthony Lakes backcountry last December 2012. These guys are passionate about the backcountry, and started their journey just last winter 2011-2012 during an Avalanche Level 1 course I was part of. So, it was a breathtaking day, with great company, and the mountainous setting was spectacular. Skiing into Bull Trout Lake is a very special treat that made this outing a HOOT! The views to west of Bull Trout Lake are splendid, and the NW aspect slopes keep the snow in "primo" conditions. Bull Trout Lake just before skiing down into the Lake flats. The avalanche forecasts for the two Avalanche Centers servicing Central Idaho rated the avalanche danger as Considerable for this past Saturday. Considerable means that skier triggered avalanches are likely, and that natural avalanches are possible. The new snow in top of near surface facets and surface hoar formed during the clear and cold weather prevalent in Central Idaho called for a high dosis of prudence. But the shifting winds from the South and Northerly aspects also formed hefty windslabs at ridges and slopes above tree line in alpine terrain. As the winds calmed down late Saturday, and the snowpack had time to adjust to the new load, we assumed an avalanche danger of Moderate for our outing. The terrain by Bull Trout Lake Inlet Lakes lack the elevation and configuration to be impacted by wind loading, but there are short steep slopes and steep rollovers that can be effective avalanche starting zones during periods of "persistent" slab instabilities due to buried near-surface facets (NSF) and surface hoar (SH). This type of instability is tricky, and it is just waiting for a trigger, and that is us - the BC skier or riders. Most skier triggered avalanches happen during Moderate avalanche danger. Moderate danger means that skier triggered avalanches are POSSIBLE, and natural avalanches are unlikely. During periods of Moderate avalanche danger skier/rider triggered slides are usually initiated at a weak area, where a slab is sitting in top of weak layer in a slope with sufficient steepness. During periods of Moderate danger there can be a lack of feedback from collapses (whmpfs) or signs of avalanches (crowns & debris), which is compounded by human perception that similar slopes have been skied without triggering slides. Please - DO DILIGENCE to determine if a weak layer is buried below a layer of more cohesive snow (slab) at the slope you intend to ski! Back to ure tour - we vigorously searched for evidence of instability to no avail. This was surprising to us, particularly when the most recent snow precipitated on a layer of near-surface facets (NSF) and surface hoar (SH) formed during the two weeks of high pressure. No buried surface hoar or NSF at West or East aspects were identified at quick snow pits. The snowpack was right-side up, with Fist hard at the top 35 cm and progressively increasing to 1-Finger hardness up to a depth of one meter. An interface was identified at 60 cm, but it was unreactive. At the elevation range we skied (8000 down to 7000 feet), there were no signs of wind transported snow, windslab formation, or slope cross-loading. Other snow and avalanche observations were unremarkable with no avalanches crowns or debris in the Bull Trout Lake inlet valley resulting from last week's storm. Above, two pictures of ski terrain to the West of Bull Trout Lake. Red Mountain can be seen above the open meadows skyline in the background. Bull Trout Lake Inlet Glades can be accessed from the vehicle pull-out at the avalanche gate at Banner Summit proper. There are glades facing east into I21 corridor that are skied by locals. In fact, these east facing slopes were recently tracked by a party of skiers. Topo Map for the Bull Trout Inlet Glades. The slope angles at the open meadows shots facing West are moderate (28-32 degrees), with some short pitches approaching the mid-30s. The ski runs are fairly open with mature trees and wide open spaces. From the ridge above Bull Trout Lake we could see another party at Peak 9220. We did not see skiing activity at Copper Mountain, but during the ski out to the our rig we could see ski tracks at Copper's South face and that most likely were laid on Saturday (1.12.2013). The pullout used by skiers to acces Copper Mountain was empty early Sunday afternoon, suggesting that Copper did not receive visitors this last Sunday. Before finishing this posting, I have to apologize for the lack of postings during the NEW 2013 year. The first two weeks of 2013 found me busy spending time with my two sons before they departed Idaho to continue their college adventures at California and Washington. It did not help that I was also participating in AIARE Avalanche instructor training for 3 days at Smiley Creek Lodge - Stanley. Early last week, during this course we had three half-days of ski touring out of Galena Pass. 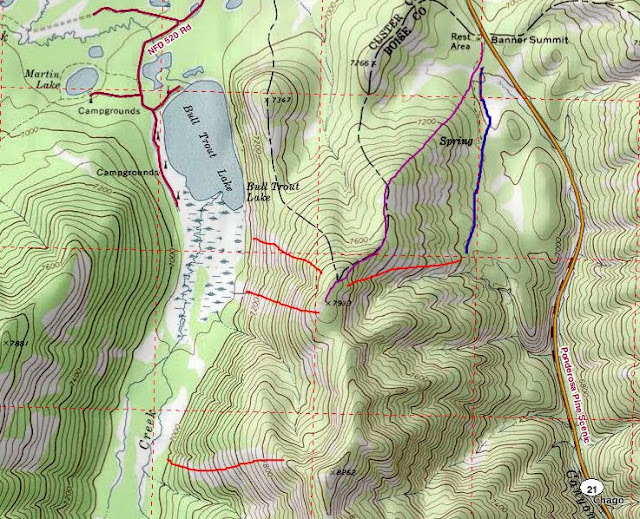 The course participants toured Mushroom Ridge, Avalanche Peak, and Titus Ridge. Meanwhile in between ski tours, Bryan and I learnt copious amounts of innovative techniques to improve the delivery of avalanche courses. Below some pictures of the AIARE avalanche Level 1 instructor course at Stanley the first week of January 2013. Last weekend, prior to leaving for Stanley for the AIARE ITC L1 course, we ski toured Soldier Mountain Peak 2 by Fairfield. Later this week I will post few pics, video clip, and narrative of the wonderful time we had skiing Soldier Mountain backcountry.